Download two versions of Spanish prime minister Zapatero(magician and boxer) together with parliament opposition Rajoy. Unfortunately, Bin Laden is still unavailable. This model looks awesome. I think the hands will be a bit difficult to assemble. Anyways, lots of new models have been added since my last visit. There's the GIR from the cartoon "Invader Zim" and a couple of hand papercrafts. There's a lot of new things at nicebunny.com. 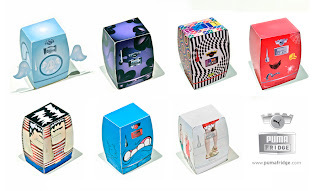 Thirteen new hedkase papertoys from different guest artists are now available. Not only that, you can also download icons and desktop & iphone wallpapers. Looking for simple models to practice your papercraft building skills? This is the site for you. There are two simple airplanes and two miniature ship models. Each model has one page of parts. 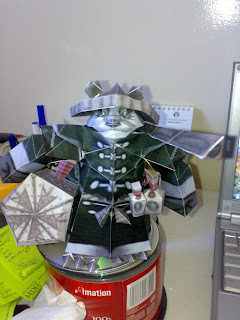 Here's a new papercraft blog that offers video game paper models. There are only two models(Pandaren Brewmaster & Dark Terror: Faceless Void) at the moment but you can expect more in the future. The designer is also currently working on Lina Inverse from the anime "Slayers." Welcome to a fun new website for kids of all ages who want to build models of actual historic buildings found in Illinois Main Street towns. There are currently ten architectural models available for download. There are also three un-colored buildings for you to color manually. CSS David was built as a private venture by T. Stoney at Charleston, South Carolina in 1863, and put under the control of the Confederate States Navy. The cigar-shaped boat carried a 60- or 70-pound explosive charge on the end of a spar projecting forward from her bow. Designed to operate very low in the water, David resembled in general a submarine; she was, however, strictly a surface vessel. Operating on dark nights, and using anthracite coal which burns without smoke, "David" was nearly as hard to see as a true submarine. Trader Sam has just released his Big Thunder Mountain Train Papercraft. This Disney model has nine pages of parts. You can also get the mod parts to convert your engine no.4 to one of the other five engines. 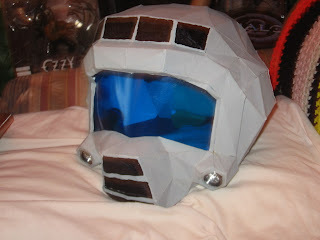 Check out this Doom Marine helmet papercraft created by one of our readers(Dillon). This helmet model has twelve pages of parts. 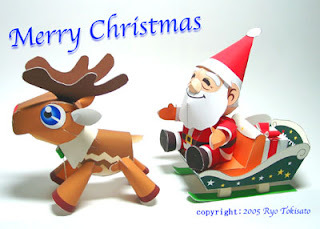 Here are three more sites with Santa Claus papercrafts. From a simple to moderately hard paper model, I'm sure you'll find a Santa that'll suit your taste. Here's a very nice-looking Santa by Ryo Tokisato. I'd love to build this model but the parts are too big for me so I think I'm gonna have scale it down a bit. Select a country then click saltar intro(skip intro) and then click the flying envelope. A pop-up will appear and then click the red link to register. Put your first name, surname, email then clave(password)-think of any word you like. Log-in and download the papertoys. Here's a site with spaceship card models from different movies and TV series like Space Above and Beyond, Battle Star Galactica and Star Trek. There are also video game models from Terran Trade Authority, Total Annihilation, Crimson Skies and Homeworld. Kim Possible is an animated television series about a teenage crime fighter who has the task of dealing with worldwide, family, and school issues every day. The show is action-oriented, but also has a light-hearted atmosphere and often lampoons the conventions and clichés of the secret-agent and action genres. 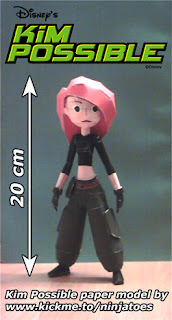 My mom collects Kim Possible toys and action figures so I'm gonna make her this papercraft. This model is very easy to build with only 3 pages of parts. 2008 is on its way and I think it's a good idea to build your own calendar. 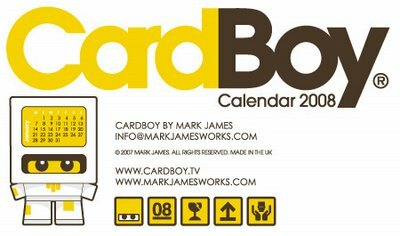 Here's a simple but cute calendar designed by Mark James.